Hi again everybody! Sorry that it took me a bit longer than usual but the second SlavEATgoD full length album is well on its way and recordings have kept us really busy. In the previous part, we briefly defined improvisation and talked about a couple of basic things that one needs to practice in order to develop his/her improvisational skills. These are theory and ear training/transcribing. So, for a more analytical presentation and a clearer picture of this subject, I strongly recommend that you take a careful look at the first part of the article. The third thing we, guitarists absolutely need is a solid fingerboard knowledge. Especially we rock/metal players are notorious for being stuck in our 5 pretty and well-organized boxes, which might result in one’s sounding mundane and limited. On the contrary, Jazz-men/women have a different approach. It would be greatly educational to simply watch a jazz guitarist playing and the way he/she moves on the fretboard. Be it John Abercrombie, John Scofield, Pat Metheny, Emily Remler, Mick Goodrick, etc. it will surprise you how different his/her playing approach even looks. After having studied jazz guitar and attended jazz-oriented clinics for several years, I also realized these players’ intervallic thinking and approach. It does truly do wonders even from a solely fingerboard knowledge perspective. This approach suggests that the main building blocks for lines are intervals and not scales, which opens a whole new, broader horizon in the construction of melodies. 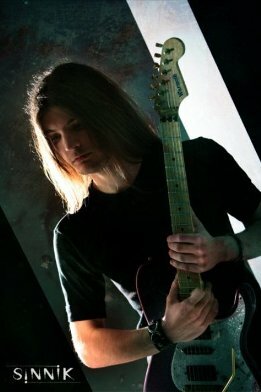 A representative example of intervallic thinking in metal context is the first part of my guitar solo from «The light is baying» from I Bow Candles’ debut album. So, in conclusion, once you’ve perfected your knowledge of the 5 boxes, not being firmly stuck in them will give you great freedom and flexibility. Key-point in the pursuit of fingerboard knowledge is to constantly (and silently) say to yourself, the names of the notes you are playing while practicing. This is easily applicable when you are linearly practicing a scale/ arpeggio or some sequence of them Finally, spotting the octave of each note is always an effective and highly suggested practice as well. After all, it’s just a subset of the intervallic thinking we spoke about. Fourth, when it comes to a certain piece of music that you practice from an improvisational perspective, you should learn by heart its chord progression and play it from all possible positions. In case you want to greatly grow your improvisational repertoire and flexibility, it would be advisable to learn each piece in as many keys as possible. There are many cases, particularly when there is a singer involved, that a key change is absolutely needed. Actually, it’s happened to several gigs of mine that the singer’s got a cold and hence he/ she asks for the song to played from a different key on short notice (that is during the previous tune of the medley this song is a part of). In such cases, re-writing the chord chart is out of the question (and looks uncool). So in order to avoid a panic attack or the awkward situation of the rest of the band and audience looking wildly at us, it’s better to be prepared beforehand. Trying to apply as many improvisational concepts to the tune in question by using just one concept in every chorus is pretty useful. To give an example, you could improvise by just using double stops in the first chorus, the tapping technique in the second and some sophisticated chord superimposition in the third one. Then, when you reach the point of naturally combining all these approaches, the result will become truly interesting and multi-lateral. For an example of solos that combine several techniques, you may check my SlavEATgoD solo compilation video . By the term «chorus» here, I don’t mean what one normally does in a pop tune, but each repetition of the chord progression in question. This use is pretty common when we are speaking about improvisation. Making a chord solo-if possible- over the progression in question could certainly do wonders. This might be just another improvisational concept, but largely overlooked in rock playing. However, it is quite enlightening to use it even just from an educational point of view. You might find that a busy progression is a blessing in disguise, for it can guide you to construct a more melodious and interesting chord solo easier than in the case of a simple progression. Fifth, record yourself improvising over this song. As I briefly pointed out in a previous article , recording is putting our playing under the microscope. This, unpleasant as it might at times be, it can either be a much needed waking kick or a useful self-esteem boost. Try to see how many choruses you can improvise without repeating yourself. This is really challenging and will keep you concentrated so as not to play mechanically and passively but really listen to and judge what you’re doing. Obviously, this is invaluable in our constant improvement in whatever we are doing musically. And of course, improvising as much as you can with other players is the best practice. Funny and obvious though it may sound, several people tend to focus on non performing practice-e.g. technique exercises instead of actual playing-and somehow neglect the real deal. Understandably, once you get used to the practice routine and become excited by it, it can become your very comfort zone and dangerously inert you. Plus, in my humble opinion, music as a universal language is a great opportunity to communicate with other musicians, be inspired by them and of course have great fun. Everyone who has experienced the sense of communicating with his/her fellow band members, can truly witness but hardly describe the telepathy and common code developed among people who play together after some time. Well, I truly hope you enjoyed this one as much as I did. Till next time, keep improvising! !